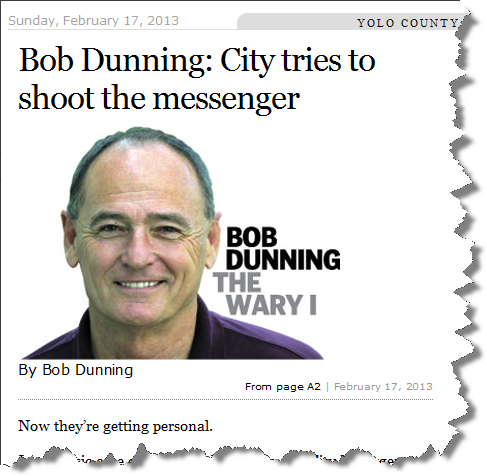 On February 13, 2013, Davis Enterprise columnist Bob Dunning unleashed what the No on Measure I campaign considered a bombshell, arguing that the consumption-based fixed rate system produced a wholly disproportionate, ultimately indefensible and unconstitutionally disparate cost. Where he arrives at his $7.80 number and how he uses this information became the subject of a California Public Records Act request, producing Mr. Dunning’s email exchanges with all city officials and employees, including Dianna Jensen, the City of Davis’ Principal Civil Engineer. The records show that Mr. Dunning would subsequently, after not getting the specific answer he sought from Ms. Jensen, take his numbers to an unsuspecting Davis City Council and practice a form of “gotcha-ambush journalism” on the councilmembers, by distorting and misrepresenting their responses. While Mr. Dunning’s math is right, his concept is wrong. The Variable Use Charge is indeed a per usage charge, but the Supply Charge in CBFR is a fixed charge based on the need for sizing the system to peak use. In doing his math, Mr. Dunning conveniently ignores the fact that the 2018 version of the current fixed charge (the Base Rate) will be decreasing from $27.25 per month down to $13.67 per month . . . or that the 2018 version of the SFR Tier 1 Metered Rate Charge will be decreasing from $3.55 per ccf down to $1.50 per ccf ($4.50 down to $1.50 in Tier 2). Mr. Dunning quickly responds by e-mail that Ms. Jensen, who knows this project and the rates as well as anyone, doesn’t know what she is talking about, because he simply does not want to accept (or even consider) this explanation of the system and how the two charges differ. The “story” he plans to use in his column simply doesn’t have traction if he acknowledges the truth of what Ms. Jensen has told him. An easy question we can all ask Mr. Dunning is, what is it about the words “which is not true” that you do not understand? As noted earlier, the person who knows this project and the rates, as well as anyone, had to ask Mr. Dunning to clarify how he derived the $7.80 figure, but somehow he expects the councilmembers to be able to provide him with a different answer. The truth is that if they did indeed provide him with a different answer, then we are in serious trouble. The good news is that, as they should in such situations, several members of the council forwarded Dunning’s question to City Manager Steve Pinkerton, who provided them with an explanation that is almost identical to the one Dianna Jensen gave Mr. Dunning in their e-mail exchange. “Do the math, councilman, and you will no longer be puzzled,” Bob Dunning quips in a rather crass and over-the-top manner, particularly in light of the rather pleasant email exchange that he and Brett Lee appeared to have. In fact, a review of their email exchange demonstrates that Bob Dunning did a great disservice to Mr. Lee, who had spent the most time of any of the councilmembers at the WAC meetings, and probably knows the rate structure as well as anyone in this community, other than those who derived it. “Puzzled” is far from an accurate description of a thoughtful and lengthy email exchange, in which Brett Lee demonstrates solid knowledge of his subject. Remember, Bob Dunning sprung these numbers of the council without context and the councilmembers had to determine for themselves what he meant by them. Mr. Dunning then returns his fire toward Steve Pinkerton. Given Mr. Dunning’s long exchange with Dianna Jensen and emails with the councilmembers, if Mr. Dunning was truly looking for an answer to his question it is curious that he never once sent his questions to either Steve Pinkerton or, for that matter, Herb Niederberger – at least in the emails we received from the city. “Pinkerton, lovingly referring to me as ‘the columnist’ throughout his memo, suggested that I am confused about how the consumption-based fixed rate actually works.” Dunning continues, but here too he misses the point. The city manager did not write that Mr. Dunning was “confused,” as though that were a personal attack, but rather he wrote that Mr. Dunning’s figures confuse the purpose of the fixed cost with the variable or volumetric charge. This is, in fact, the exact same point that Dianna Jensen had tried to explain to Mr. Dunning the week before. When Mr. Dunning did not get the answer he wanted from Ms. Jensen, he moved on and ambushed the council with the same question and no context. This gets back to the point that Dianna Jensen made earlier, and the problem here is that one charge is being used to assess water use, that is the variable charge, while the other charge is being used to estimate the customer’s share of the impact on water capacity. It happens to be based on actual usage. As we know from showing the calculations during the election, the other means to assess impact is strictly meter size. That is a far more crude measure and it results in those at the lower ends of use subsidizing those at the top end. Bob Dunning couldn’t be more wrong here. In fact, the problem with the Bartle Wells system is that you aren’t paying for what you use, you are paying for the size of your meter, which means that the people who use less water actually pay a lot more, per gallon or ccf, than those who use more water. But Mr. Dunning is entitled to his opinion – taking people’s answers and distorting them is more questionable. David: Not a column in the DE with this? wow this is pretty interesting and i’m surprised that no one has commented on it yet. dunning seems to have really taken liberties with some of his writing. also, his column responding to the pinkerton memo seems way over-the-top – for a guy who makes a living roasting others, he has an incredibly thin skinned. GreenandGolden: If you are suggesting I submit this to the Enterprise, I’m reluctant to do so and believe they would be reluctant to run it. No, don’t submit it to The Enterprise. It’s over and we are moving on. But it is helpful to understand what Dunning struggled with, but there is no reason to go after someone’s job over this or further the damage caused by the public fight over this project. I agree with Ryan. Time to drop it and move on. There are copious examples of people in the press and media taking liberty with creative math to support their bias. Just look at what the liberal media has written and ha said about Obamacare. The Vanguard has also done creative math on crime statistics to back a bias of law enforcement having a racial discrimination problem. The way it works… the journalist has an opinion and he starts looking for facts to back his opinion. In many cases he can argue his point with nuance. Just because someone disagreeing with him can argue against his point with different nuance does not justify an attack on his journalistic integrity. Frankly, journalistic integrity is so far gone we would be better off not expecting it, and then celebrating it when we catch an all-too-rare glimpse of it. Bob is a columnist. Standard rules of journalism don’t apply to what he writes. Meanwhile, Tom Sakash did a great job [i]reporting[/i] the water issues. i have a lot of problems with frankly and don’s perspectives here. first frankly, the problem here isn’t creative math. while i can disagree with dunning’s math, the problem here is misrepresenting the views of council and playing gotcha / ambush journalism. the standards of a columnist do not allow him or at least should not allow him to blatantly misrepresent the views of others. moreover, he was in effect trying to practice journalism by uncovering the truth and in so doing, he actually misrepresented it. i think that’s a grave disservice and i’m frankly appalled you would shrug it off as merely being a columnist. tom sakash did a decent job of reporting on the water issues, but dunning had five columns a week where he was allowed to mau mau the public into confusion and he needs to answer for it. I’m not sure why David feels the need to rehash all of this. Bob’s position on the water project was from the start quite transparent and unlike some around here, he never tried to hide his position behind a bogus claim of impartiality. He is a columnist, writing his own opinions, and in the process, risking his own reputation (which by the way is his to treat as he wishes). Some may have disagreed with his positions (I certainly did) and some may have found some of his methods questionable (again, as did I), but I think we all should respect the fact that he had the courage to sign his name to everything he wrote. Calling for his head while hiding in anonymity is…well I think you get the point. Mr. Greenwald has full entitlement to report and comment on a published document from any credible source. Bob Dunning enjoys the same privilege, as do we. Credit both these persons for the courage to lend their names to their opinions. i don’t think i called for his head, i do think he needs to answer for his “reporting” and what he is doing is in fact reporting – he’s claiming that certain people said certain things and claiming that his view of the rate structure is backed by city staffers when in fact it was not. and frankly i don’t think my view is any more or less valid if i post under Davis Progressive, Sue Greenwald, or Mark West. Mark West said . . . Curious statement Mark. I clearly have tried to maintain impartiality from a public perspective while having private opinions that for the most part remained private. I’m not sure why anyone trying to do the same would qualify as bogus. I believe there is a big difference between acting with impartiality – as you attempted (and largely succeeded) to do, and acting partisan while claiming to be impartial. The former is appropriate, the latter bogus. I didn’t say your view was invalid, what I left unsaid was that I thought it was the act of a coward. I have heard many justifications for posting anonymously, and while I understand the point of view, I believe that the act diminishes our ability to have an open, honest discussion. Complaining about an individual by name, while maintaining your own anonimity, is in my view completely inappropriate. Boy, I sure agree with this. I think some people shy away from committment for fear of being wrong. So they claim what they demand is a completely objective middle ground backed by only the facts that support the ideas, views and self-interests they hold deeply… a behavior that is made trasparent when they reject other just-as-valuable facts that don’t support their ideas, views or self-interests. I have a lot more respect for people that take a clear position and defend it to the end, than I do people claiming inpartiality with a clear bias for one side over the other. But I do have some empathy because I think some people are so used to this fake impartiality behavior, or have so much committment risk-aversion in their personality, that it is very hard for them to change. The math that Bob Dunning cited was correct. Diana Jensen and others did not have a proper understand of Bob’s perspective to answer Bob’s questions. Bob was able to see the water rates in both the perspective of CBFR and Proportional billing. Diana had only demonstrated her ability to see it in terms of CBFR. Diana did not have enough knowledge about various perspectives of water water rates to answer Bob’s questions. Diana should have admitted that in the perspective of strictly black-box proportional billing, it is correct that when a user pays the water agency more when the user consumes water in the summer. Edgar Wai said . . .
You have shared with us your [u]personal opinion[/u] that the Supply Charge within the CBFR structure is “incorrect” but is your assessment of correctness anything other than a subjective personal opinion? I appreciate that you have put a great deal of time into analyzing the mathematical fairness of how to pay for the water project. My concern is that in being so focused on this particular aspect, you may have missed part of the bigger picture of the dynamics of our community. While I am sure that the rates were the real issue for some people, I am equally sure that for others, this was only a proxy battle in their goal of blocking growth at all costs. Some that i talked with said so. There are many different values and goals within our community. Defining a “fair” system is a laudable goal. Assuming that everyone will accept your definition of “fair”, or that everyone’s goal is your definition of “fairness” is unrealistic. 1. The water needs are resolved and the rates are fair. 2. The water needs are resolved but the rates are not fair. 3. The water needs are not resolved, but the rates are fair. 4. The water needs are not resolved, and the rates are unfair. Could you confirm that we are on the same context of trying to get outcome #1? Actually Edgar there are far more than four options and that is part of the problems. You are assuming dichotomy when in fact, there are considerable shades of gray. The water needs may be resolved for some but not others and the rates may be fair for some and not others. One of the questions isn’t whether the rates are fair for everyone, because that is probably impossible, but whether the current system is more fair than other systems. By recasting that framework, your choices blow up and the question takes on a different light. How do you evaluate fairness? The way I chose to evaluate fairness was in terms of cost per unit of water. Under the existing rate structure, those who used a lot of water paid a lot less per unit than those who used very little water. The new rate structure shifted those costs to make it fair more equal. So in the end, those at the 75% lowest rate of usage for water were advantaged by the new system while those at the top end, are less advantaged than they would have been under the existing rate structure. Hence for me, that encompasses the issue of fairness. How do you know if the shift is enough? If I propose a rate structure that shifts it more how do you know if it is more fair or less fair than CBFR? At some point you have to acknowledge that the perfect can be the enemy of the good and you make the best decision that you can. This has been updated to add a scenario on conjunctive use.